Welcome to all new club members! Thank you for joining Delta Retreads at the Sungod Pool. Some newer members worry about whether they are fast enough to be part of the club. Don't worry about this. We cater to a wide range of swimming abilities and speeds. Our coach will initially assess you and place you where he thinks you belong, but please let him know if you think you should be in either a slower or faster lane based on your speed and your lanemates. Feel free to arrive on deck a few minutes early if you want to do some light stretching. Ask our coach for suggestions on how to stretch. The other highlight is getting out early to use the hot tub or chat in the change room. Sunday is our main workout. Every Sunday practice is followed by a "coffee klatch" in the poolside room by the lobby. Coffee time is a good opportunity to meet fellow members and find out if any activities are being planned, such as upcoming swim meets or a Thursday 'pub night' after practice. At coffee time, everyone donates $2 towards coffee. We take turns in pairs bringing in food for everyone to enjoy. A food sign-up sheet is available in the room. At the start of each practice, the coach will provide a workout summary. Some lanes will (through consensus) adapt portions of the workout to better suit their goals and abilities. For this reason, it is important you show up early, review the workout, discuss with lanemates, and chose your lane wisely. Some lanes swim clockwise while others swim counter-clockwise. Your lanemates will give you direction. Clockwise or counter-clockwise, swim up one side of the black line and down the other. Please try to be on time for practice. If you're late, find out what set your lanemates are doing and join in at the same place in the work-out. You can slip in behind your lanemates and do a few lengths of the work-out at a warm-up pace. At the beginning of each set, determine the order of speed among people in your lane, and leave the wall in that order. Please remember that your speed changes based on equipment (paddles, fins, drag devices) and/or stroke. Please adjust the order within your lane to accommodate this. Keep a respectable distance (typically 5 sec) from the person ahead of you. This allows the lead person room to turn. On short sets, if you find yourself catching the swimmer in front of you, leave a longer gap. On longer sets, if you catch a swimmer in front of you, tap them on the foot to let them know you would like to pass. If your foot is being tapped, finish the length and move to the far side during the turn to allow the passer to go by. At the end of each interval, make sure you move to far side of the lane, to allow other swimmers to finish. If you're falling far behind on a longer set, it's okay to skip a 50 (two lengths) in order to keep up with your lane. If you find yourself doing this a lot, you might enjoy a slower lane. And if you're waiting too long for your lane-mates to reach the wall, consider challenging yourself in a faster lane. If you need to stop, squeeze into the corner to the direction you have been swimming from, so others will have sufficient room to turn. If you have any questions or concerns, please talk to our coach or one of the members of the executive. Your lanemates can identify these people for you. Last, but not least, remember to enjoy yourself. 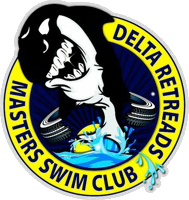 Delta Retreads Masters Swim Club is all about fun, friendship and fitness.